Last month, I took a roadtrip to Chicago with my blogger bestie, Karina. It was such a fun girl's getaway and I received so many questions from y'all about our trip. Today I'm breaking down where we stayed, what we ate, what we did, and what I wore. I'll also share a few of my Chicago favorites for your future travels. Let's do this! During our time in Chicago, The Gettys Group hosted us at the amazing Blackstone Hotel. I've stayed at my fair share of hotels in Chicago, and this was definitely my favorite. It's located on Chicago's Cultural Mile and right down the street from Millennium Park and Lake Michigan. It's the perfect location in the city and our room even had amazing views of Lake Michigan and Navy Pier. The Blackstone Hotel holds so much rich history, yet doesn't feel dated. The luxurious hotel has modern touches and newly updated rooms- just wait til you see the marble bathrooms! How gorgeous is this bathroom?! I love the marble and the huge, luxurious shower! There's even a TV in the bathroom mirror, so we watched the World Cup as we got ready in the morning! Karina is from Brazil and was cheering hard for her team. Now let's talk about The Blackstone's lobby- Interior. Design. Goals. The lobby was recently updated with gorgeous, locally sourced furniture and decor that has modern touches, yet still compliments the hotel's past. It's the perfect place to relax and enjoy enjoy signature cocktail from Timothy's Hutch and listen to live jazz music from local artists (Wednesday and Friday evenings). Speaking of local artists- The Blackstone hosts over 1,600 original pieces of art from (primarily) Chicago-based artists. We took a tour to see some of the art and it was incredible. As I mentioned before, the hotel holds so much rich history. Since 1910, The Blackstone has attracted celebrities, socialites, politicians, and even mob members! Fun Fact- Al Capone stayed at The Blackstone whenever he was in the city and would even get his har cut at his own barber chair within the lower level of The Blackstone! Dinner at Fisk and Co. was an absolute treat! The weather was incredible so we were able to sit outside and take in the amazing city views. If you go, you MUST try their goat cheese cheesecake. Everything we ate (and drank) was so tasty. They have something for everyone on the menu but they specialize in mussels and oysters. The inside of the restaurant was super chic with a nautical twist. We had an amazing dinner at The Kitchen which is owned by Kimbal Musk. He also owns their sister restaurant here in Indy, Hedge Row Bistro. Karina and I love Hedge Row so we were excited to try out The Kitchen during our time in Chicago. They serve delicious, real food from American Farmers. Our meal was amazing (and so were the craft cocktails). We were absolutely stuffed but we still saved room for the Sticky Toffee Pudding dessert :) The Kitchen has an insane location right along the river. We didn't sit outside because of the impending rain, but the views were incredible even from our table inside. Highly recommend! Summer House Santa Monica felt like a little escape to the West Coast. They have a laid back Cali vibe complete with beach house décor and a fresh, locally sourced menu. Be sure to grab one of their cookies on the way out (so good!!) and take some cute pics- this place is majorly insta-worthy! We grabbed some yummy margs and chips & guac with our friend Ali Stone at Barrio. We had such a great time that we almost missed our boat tour! We literally had to sprint to catch our boat tour (I blame the margs and guac), and we just barely made it in time! This was my second time on Chicago First Lady’s Cruises and I highly recommend it! We did the architectural tour and it was so cool learning about all of the history behind Chicago's famous buildings. The views are incredible! I've been to Chicago many times but this was my first time visiting Skydeck Chicago! The Skydeck is an incredible experience and I highly recommend going during your next trip! The Skydeck is located in the Willis Tower- which is the tallest building in the Western Hemisphere! There is a glass floor balcony that extends 4 feet out so you can look over the city. It's a crazy feeling because you're 1,353 feet up in the air and it feels like you're floating! Pro tip: Make sure to get City Pass so you can use the Fast Pass Lane and bypass the main ticket and security lines! 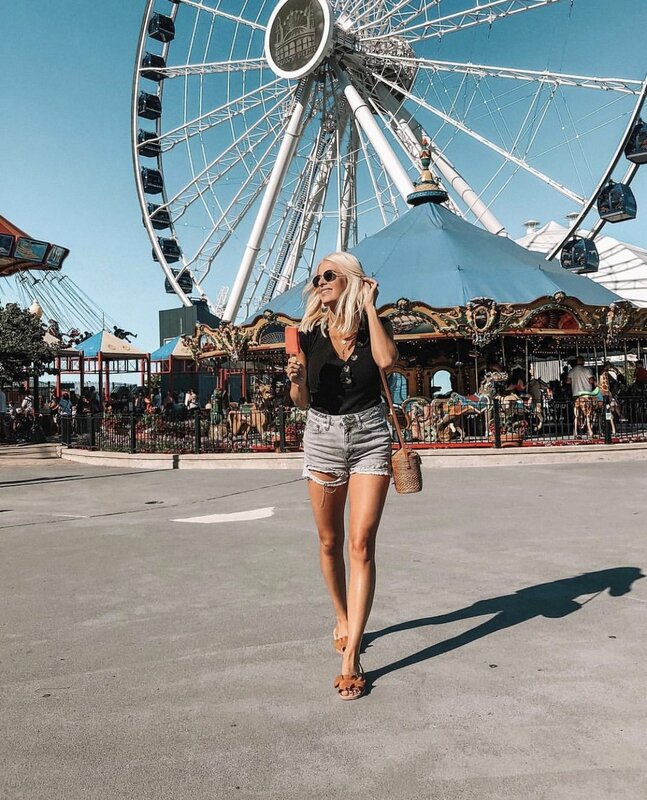 Navy Pier is a must! You will feel like a kid again. Make sure to get some ice cream and take a ride on the Ferris Wheel. The views are gorgeous! It's not a Chicago trip without some major shopping on Michigan Ave! The Magnificent Mile has so many stores that we don't have here in Indy. I always hit up Zara and Topshop- which can be dangerous. 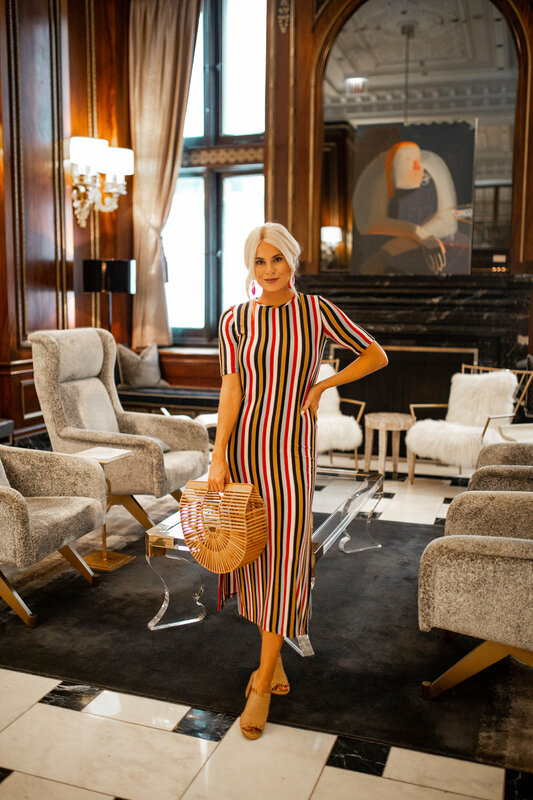 There was a sale going on at Zara which is where I snagged my striped dress from earlier in this post (it's sold out online so I couldn't link it!). We actually rented Divvy bikes which is how we got around during our shopping adventures. It's only a few bucks and you can dock them at different stations throughout the city. The rest of the trip we just walked or Ubered which is super easy in Chicago. Here are a few of my other Chicago favorites that didn't make the cut this trip!